First off, let me start by saying that I do not in anyway try and compete with The Cripsy One. I wrote this article mainly for Da Warpath Quarterly, which is a Orcs & Goblins E-zine (check it out at www.da-warpath.com !). But I figure that some of you folks might not read that (shame on you, shame! ) and it would be a shame if my work were to go to waste . Anyways, lets kick-start this, shall we? 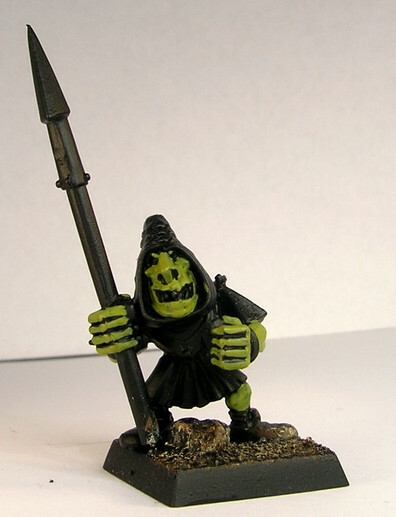 *Cough, cough* Ok, this is my article on how to paint Night Goblins, or rather, how I painted my Night Goblins. 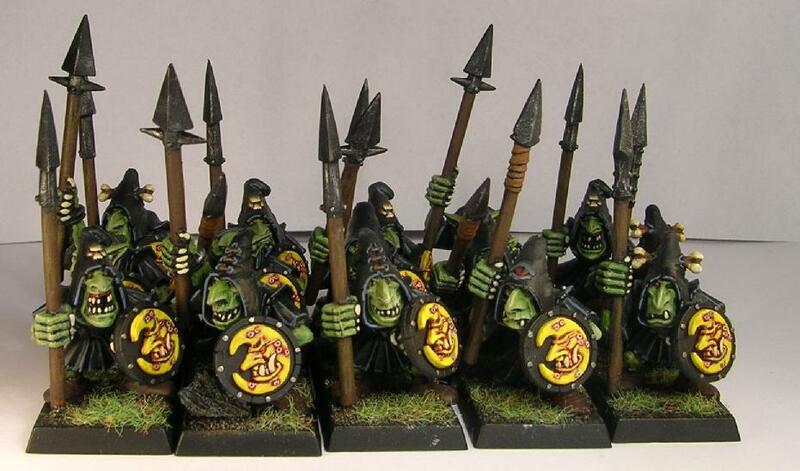 As you probably know, there are about thousand ways to paint greenskins. But I like to think of this way as quite a unique one, or atleast uncommon, involving the Camo Green line of green (of the Citadel-range of course!) and several different techniques. But it’s quite easy to do, and even tough it takes some time. But with the finished process of painting, it gives a good gaming standard, in my humble oppinion. I try and do my minis in large groups, because it goes a lot faster that way (and when painting several dozen goblins it’s a relief to know that it could have taken twice the time if you’ve painted them individually). 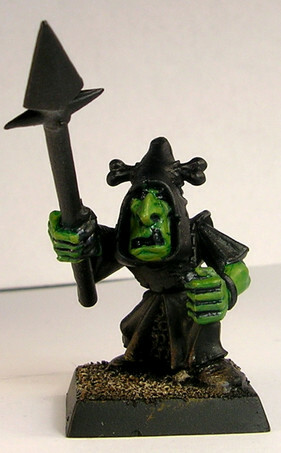 So I start by removing the parts required to make the goblins from the sprue, using a clipper (could easily be substituted by a knife, but it’s faster with a clipper and you need to spend less time cleaning up the parts later on). The shields can stay on the sprue, but the part of the sprue containing the shields and the moons (which I’ve used here) is removed from the main part, separately (so you’ve got shields and icons four by four, easier to spray and paint later on). I’ve stayed away from the spear arm holding his spear in a awkward position, looks too weird for me. Next I clean the parts using a knife. A file will work as well, but I find the knife to be more effective. Take off flash and moldlines by running the blade across the surface gently, I’ve also removed some of the skulls on the hoods and also the moons (just don’t think they fit). Then glue the parts together and put them on their bases (still, leave the shields for later), simple as that! The first step. Started off by painting the base. 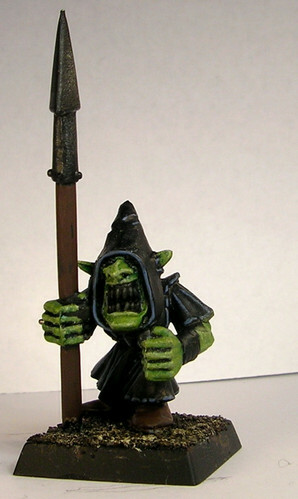 Begin with a overbrush with Scorched Brown (pretty much paint on the brush, but gently stroked across the surface), followed by a lesser overbrush of Bestial Brown and lastly a drybrush of Bleach Bone. Make sure there is little paint on the brush and slight strokes, as the colour should only be on the highest parts of the sand. Next is to paint black on the skin, those parts where the spraying missed. This is done with Chaos black and water mixed with it. Note that I only painted the skin-parts black, the rest of the mini still grey waits for later. This is one of the most time-consuming parts of the painting-process. All skin parts are painted Camo-green, with two layers and mixed with some water, so the skin doesn’t appear thick once finished. Now the mini is given a wash of Dark Green ink. The wash is approximately two parts Dark Green ink and two to three parts water. This will make the skin much darker, and a bit shiny, but it’ll look better later. 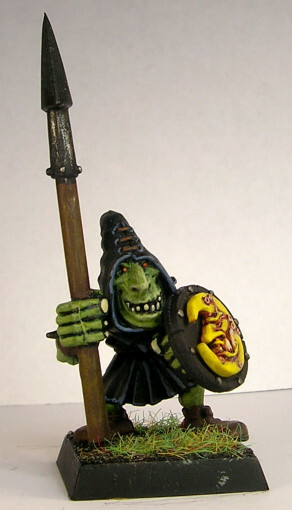 I’ve gone about highlighting these Goblins using the drybrushning-technique (wiping off most of the paint on some paper), this doesn’t give the mini as clean finish as layering does, but it’s faster and easier (since it picks out the higher parts of the skin), which is good when painting a greenskin horde. This is done with a older brush, as it wear out the brush quickly. After the skin has been brought back to it’s base colour, but with the deepest parts darker and overall a much more standard-green tone to it, I’ve done the same as the previous step, drybrushed. But this time with Rotting Flesh. 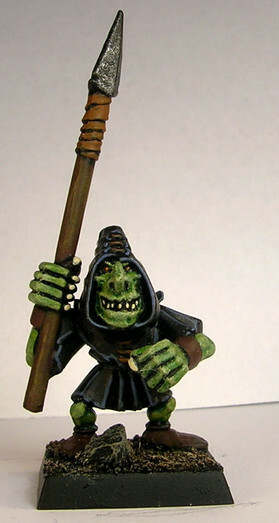 This gives the goblin a pale skin-tone, which suits goblins. With the skin done I paint the parts left, which isn’t skin or the base, with a watered down Chaos black. It’s messy to drybrush so the areas around the skin gets green, and when repainting these parts it’s just as easy to add painting black on those parts were the spray missed. With the repainting done it’s time for cloaks. This is simply extreme highlight (a light colour over a dark, only painted on the highest parts) of Shadow Grey. 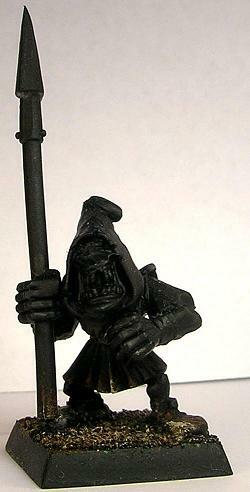 As the goblins are good models you can easily make out these parts. Also, the shoes, spear and the type of leather bracelets that are a bit thicker are painted Scorched Brown. The tips of the spears are also painted now, drybrushed with a light layer of boltgun metal. 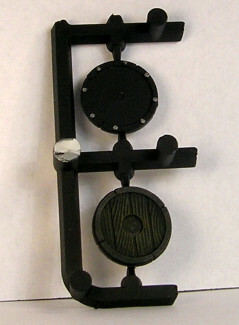 The sprue is made so that the four shields are still attached to each other, same goes for icons. That way it is easier to spray them and to paint them. I’ve started by painting black where the spray missed, then the nails with boltgun metal. This makes a great contrast towards the black of the shield, yet very simple. The back of the shield is drybrushed Bestial Brown. This surface will be shown very rarely, so might as well make it easy to paint. 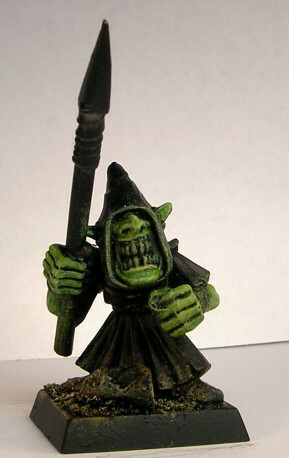 These were sprayed with a Skull White undercoat, unlike the rest of the mini. As these will be yellow it’s better to spray it white, it’s easier to apply yellow or bright colours. After sprayed I did a layer of watered down Skull White coat (about 50-50 water and white), and once dry a coat of very slightly watered down Flesh Wash. This should become pretty dark to give the symbol depth. The second symbol on the picture is a highlight with Bubonic Brown. A great colour to build up to either yellow or bones. 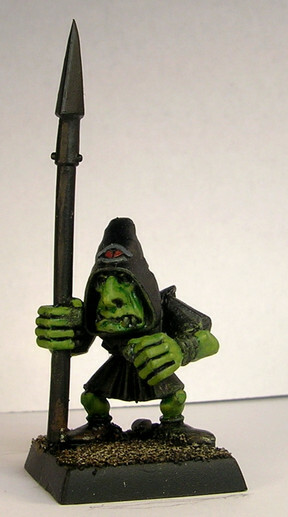 Same as the goblin, these are neat sculpts, so you can clearly see which part to stay out of. Third is a highlight of Sunburst Yellow, leaving a rim of Bubonic Brown next to the deeper parts. Now the teeth is painted Bleach Bone and the eyes Blood Red. To finish it off the eyes are highlighted (leaving a little red left) with Fiery Orange and the boils (the parts that stand out) are carefully drybrushed lightly with Skull White, to pick them out. The shield and icons are removed from their sprues, the edges where they were attached to the sprues are smoothed down and repainted yellow/ black. Then they’re glued together and glued to the fist of the goblin. Lastly the base get some PVA glue and patches of static-grass. Hope you've enjoyed my article!